Like 40 million other adults in the United States, I too suffer from what is sometimes debilitating anxiety. A therapist once suggested I may have Generalized Anxiety Disorder, which essentially means that my mind doesn’t discriminate when it comes to feeling anxious - basically anything can make me feel like a huge weight is sitting on my shoulder and something bad is going to happen any second. I’m sure that you, too, can probably relate. My anxiety is something I have lived with for as long as I can remember, and for as long as I realized what it was, I have been determined to fight it on my own. Medication is a wonderful thing for many people out there, but it’s not for me. This means that I have to fight my anxiety that natural way. Up until now, that included meditation, yoga, regular exercise, and releasing all of my stressful thoughts on my husband for as long as he will listen to me. Then, a few months ago, someone suggested I try CBD pills. After that, about 20 more people suggested I try CBD pills, and suddenly, I was reading about them everywhere. 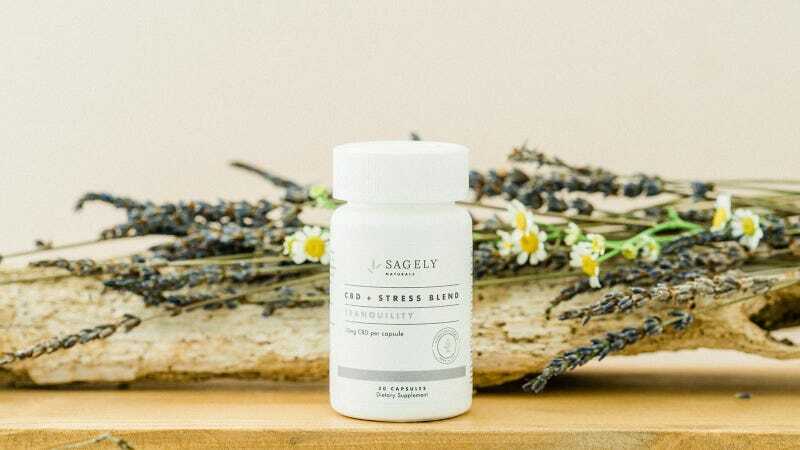 But I was skeptical: could CBD pills actually help with my anxiety and stress without making me feel like a zombie? CBD (AKA cannabidiol) comes from the cannabis plant (the same place hemp and marijuana come from). But this isn’t something that’s going to make you feel high - CBD contains almost no THC, which is the psychoactive component in weed that makes users feel sleepy, hungry, and just plain stoned. In other words, it has the calming effects of marijuana without making you high. Many (though certainly not all) doctors and researchers have sung the praises of CBD, saying it can help with anxiety in a more natural way, and can also assist people in dealing with post-traumatic stress disorder, nausea, vomiting, and other illnesses. A week before I was set to fly across the Atlantic Ocean into Europe, I decided to try the pills. I absolutely detest flying, and it is one of the top three things that give me anxiety that leaves me sleepless, stressed, mean to everyone around me, and just generally unable to act normal. I was doing my usual pre-flight ritual, which includes waking up throughout the night thinking about turbulence, and trying to check things off my bucket list with the thought that I might die during the flight (morbid, but yes, this is how my brain works). I needed relief. I took a Sagely Natural capsule before bed one night as my mind worked into anxious overtime, and sleep seemed like a distant fantasy. For awhile, I lay in bed and stared at the ceiling. And then, after a bit, I started to feel slightly more mellow, like I was actually... relaxing? Calming down? It was nice, and then I fell asleep and almost made it through the entire night. Definite progress. The next few nights went this way: I would get into bed feeling anxious, take a pill, and start to feel more calm and soothed. The anxious thoughts were still there, in the back of my head, but they weren’t screaming and trying to push their way to the front anymore. The next few weeks went the same way, and I realized something: the hype was real. The CBD pills were working. They did tend to make me a little sleepy, but I can’t tell if that’s because I was taking them at night when I was already tired, or if they were the reason I was getting tired. Now, of course, it’s entirely possible that the positive effects of the pill were, in fact, the placebo effect. Despite all of the good things to be said about CBD, there still aren’t enough long-term studies out there to prove that it really does do all of the things it says it does. But honestly, even if it is a placebo effect, I don’t care. It’s working, and for me, and that’s all that matters. I realized something else too: they weren’t a miracle, like many people made them seem (for me, at least). While they definitely helped ease my anxiety and made me feel less stressed, they didn’t take it away completely. Still, a little something is better than nothing, and I will absolutely keep using them as needed. And if you’re in a similar situation, I suggest you do too!